WASHINGTON, Sept. 10 (Yonhap) — U.S. President Donald Trump has received a letter from North Korean leader Kim Jong-un calling for a second meeting between the two, and planning is already under way, the White House said Monday. Trump said last week that he is expecting a letter from Kim amid stalled negotiations to dismantle the regime’s nuclear weapons program. The letter was “very warm” and “very positive,” White House press secretary Sarah Sanders said in a press briefing. She said the U.S. is “open” to a second summit and talks are under way to coordinate it. Trump and Kim held their first summit in Singapore in June, and North Korea committed to work toward “complete denuclearization” of the Korean Peninsula in exchange for security guarantees from the U.S. But negotiations to implement the deal have appeared to hit an impasse. Washington demands a full inventory of Pyongyang’s nuclear arsenal, while the communist nation insists on first declaring a formal end to the 1950-53 Korean War, which ended with an armistice. South Korean officials met with Kim in Pyongyang last week to arrange a third meeting between South Korean President Moon Jae-in and the North Korean leader. The delegation said Kim reaffirmed his commitment to denuclearizing the Korean Peninsula and expressed his desire to resolve the issue before the end of Trump’s first term in early 2021. The Trump administration has touted a number of North Korean actions as evidence of progress toward the dismantlement of the regime’s nuclear and ballistic missile programs. And as noted by Trump, last weekend’s military parade in Pyongyang did not showcase intercontinental ballistic missiles capable of reaching the U.S.
Trump has expressed optimism about the prospects for North Korea’s denuclearization. 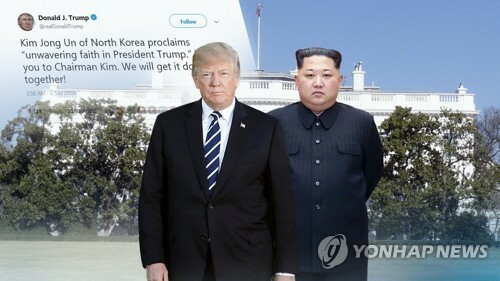 But last month he cited a lack of progress toward that goal in canceling a planned trip to Pyongyang by U.S. Secretary of State Mike Pompeo.